All the prize-winners will present their winning projects on Friday, 11 November 2016 10 am to 2 pm in the Magazin in der Heeresbäckerei in Berlin as part of the public DETAIL Symposium. Besides their award-winning projects they will present other outstanding projects created by their offices. DETAIL cordially invites to attend this event. Allow yourself to be inspired by these future-oriented projects, which have been chosen and awarded by a prestigious jury. Admission is free. The number of participants is limited and registration is required. Members of the Brandenburg Chamber of Architects can have participation in this recognized training event acknowledged as part of their ongoing training requirement. Go to registration. The DETAIL Prize 2016 goes to Sean Godsell Architects for their MPavilion project in Melbourne, Australia. Second place is awarded to Brandlhuber+ Emde, Burlon / Riegler Riewe Architekten for their St. Agnes project in Berlin. In third place are Morger Partner Architekten for their Hilti Art Foundation / Huber Uhren Schmuck project in Vaduz, Liechtenstein. The DETAIL structure special prize, awarded for the first time this year, goes to Knight Architects for their Merchant Square Footbridge in London, UK. The DETAIL inside special prize goes to Florian Busch Architects for their K8 building in Kyoto, Japan. Between 1 September and 14 October, DETAIL readers and online users voted for their favourites from the 13 projects nominated by the jury. Now the winner of the Readers’ Prize has been determined: The winner of the DETAIL Readers’ Prize 2016 by a large majority are the Block Research Group – ETH Zurich, Ochsendorf DeJong & Block Engineering, and The Escobedo Group. 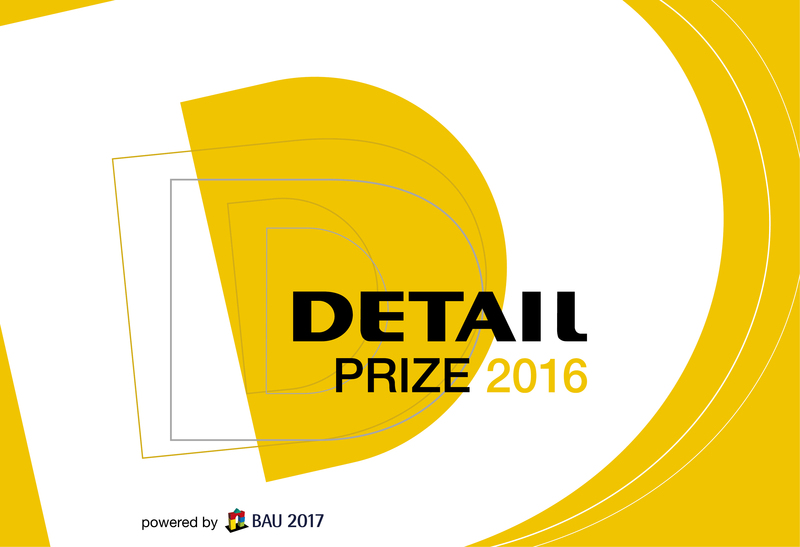 Between 16 January and 21 January 2017, the prize-winning projects will be presented at an exhibition during BAU 2017 in Munich. The international DETAIL Prize has been awarded for the seventh time. The judges were looking for realisations in which the overall design concept and the detailing were brought together in a coherent way. Out of 337 submissions from 42 locations around the world, the jury selected the best projects for the DETAIL Prize and the two special prizes DETAIL inside and DETAIL structure. The chosen projects are future-oriented, innovative and pioneering, and consequently in the jury's view display outstanding architectural and technical qualities. DETAIL awards the DETAIL Prize every two years in cooperation with BAU as the premium partner, Josef Gartner GmbH as the main sponsor, conceptual partners from the political arena, and industry sponsors. This year for the first time, construction software manufacturer Orca is also on board as a sponsor. For all the information on the symposium and the reader-voting, visit www.detail-online.com/detailprize.